Come chant your way to peace, bliss, balance and an open heart! Gurunam Singh’s music heals and elevates. His humour and stories soothe the soul. Bless yourself with an evening to remember! Using Kundalini yoga, meditation and live music with Gurunam Singh we will explore the potential found in prayer, sound and creation. When just a little bit of peace is found, one is only a small step away from the flow of creation pouring through the being. Please bring a yoga mat and cushion! For more information contact Nirmal at nirmal@thewellnesspath.ca or 416-716-1402. Gurunam Singh’s musical influences range from gospel, folk, and country to classical Indian raag and from traditional Sikh hymns to devotional Hindu chants. His music is deep, heartfelt and accessible to all. In Gurunam’s teen years he started having powerful experiences when praying. At age 18 Gurunam Singh was gifted a guitar and began composing simple songs, some personal, some devotional. At 22 he discovered Yogi Bhajan and the Sikh Dharma. When faced with difficult times, the teachings of Yogi Bhajan gave him a home; a way to balance himself. They also gave him Sadhana (daily spiritual practice), which has been an immensely powerful force in his life. Gurunam quickly became involved in sacred chant music and soon began leading chants in the pre-dawn early morning ambrosial hours. He spent long periods of time in the solitude of his own home, and was often to be found in the Sikh temple late at night, chanting to God and writing arrangements for devotional songs. Chanting the Sacred brings Gurunam to a blissful, calm state of mind. Gurunam Singh is a poet, mantra artist, and workshop facilitator. 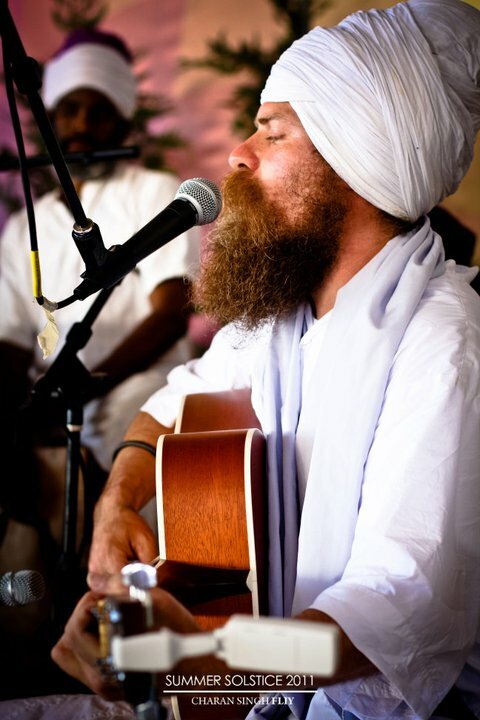 He tours both nationally and internationally, leading Kirtans and Yatras in India every year. He has several CD’s, some of which can be found on the Spirit Voyage label. He has studied with some great ragis such as Bhai Avtar Singh and Ustaad Narinder Singh Ji, both from India, and Dya Singh from Australia. For more on Gurunam Singh’s music, please visit gurunamsingh.com.